Picture this: you lounge near the pool, watching your daughter play. You smile as she dives off the diving board and kicks her way across the deep end. Then you frown as you notice a swarm of bees hovering around her. Why do bees congregate near your pool? Bees need water during hot weather just like we do-warm water evaporates and cools the hive. Several bees will leave the colony, looking for a water source. They’ll also look for mineral salts near your pool, which helps their young hatch and mature. Unfortunately, bees pose a slight risk to your children, especially if your kids have sensitive to bee stings. Although you could use potentially harmful chemicals to remove the bees, these safe DIY methods make for a great alternative. If they can’t access your pool, local bees will travel elsewhere for water. Cover your pool when your family doesn’t use it to deter these pests (as well as keep out leaves, twigs, and other debris). Fill a 16 oz. spray bottle with 1/8 cup dish soap and as much water as possible. Spray bees near your pool. Keep in mind that you don’t have to eliminate the entire bee colony. Most colonies send messengers to find safe water supplies. If these messengers don’t return, the colony will stop sending messengers to your pool-keeping your pool bee-free. Don’t want to hurt the bees? Consider providing them an alternative water source. This method is especially effective for honeybee control in desert homes. Fill a trough or another container with water and place it away from the pool. Since bees look for mineral salts, you could add a pinch of Epsom salts to the water as well. With cleaner, safer water available, the bees will likely choose the trough over your pool. Dryer sheets work surprisingly well as insect repellants. While they may not work in every case, dryer sheets contain a couple of bug-deterring chemicals: linalook and beta-citronellol (of the citronella family). Place dryer sheets around the edge of your pool to keep bees away. If dryer sheets around your beautiful pool looks out of place, consider hiding them in plants or baskets. With a little creativity, you can keep your pool free of pests without detracting from your artistic design. Lemongrass – Lemongrass often appears in citronella products because it contains insect-repelling properties. Plant lemongrass along the edge of your poolside and watch if the bee population reduces. Eucalyptus – Like lemongrass, eucalyptus appears in many insect repellants. Plant a eucalyptus tree next to your pool, or place some eucalyptus oil nearby. Wormwood – Wormwood has a distinct smell that repels wasps and bees. Plant it near your pool and your garden to protect your property from insect invasion. Bees love sugary scents, so keep soda, juice, fruit, and candy away from the poolside. If you do eat near your pool, use a netted canopy to block your food. Remember that perfume, suntan lotion, and body sprays can attract bees as well, so don’t apply those before hanging out at the pool. Moth balls contain a pesticide that bees can’t stand. Stick mothballs in old nylon stockings and hang them from the fence around the pool or from nearby trees. Just make sure they’re not too close to your pool, as they can be harmful to humans. This may sound like a ridiculous method, but it’s worth a try. Bees stake a claim on their hive’s territory and don’t venture near other hives. Fill a brown paper bag with air, seal it, and hang it near your pool. The bees may believe another hive is nearby. 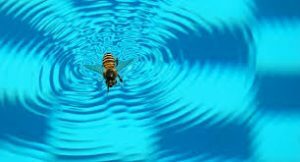 If you’ve tried these methods and bees continue to hover around your pool, call a bee removal expert. The expert can locate the source of the bees and safely remove them from the premises.